Englewood Hospital and Medical Center offers short-term rehabilitation therapy for hospitalized patients and rehabilitation care for outpatients. Our interdisciplinary team, consisting of occupational, physical, and speech therapists, helps people return to normal activities following illness or injury. A referral from a physician is required. We offer day and evening hours, as well as free parking, including valet parking. Wheelchairs are available in the lobby. The Rehabilitation Medicine program helps patients regain function that has been impaired or limited due to medical conditions or injuries. Our rehabilitation specialists will help you maximize your physical abilities, using a full range of interventions and approaches in a nurturing environment. Many of our patients do not need surgery to receive these services, but for those who do, we offer rehabilitation both before and after surgery, or as part of a care plan after you’ve been discharge. If you have been discharged from home-health visits, you may qualify for continued outpatient rehabilitation care at the medical center. We also provide innovative, personalized rehabilitation services for vertigo (benign paroxysmal positional vertigo, or BPPV) and arm lymphedema associated with cancer and cancer treatment. Your needs will be evaluated by our staff and a personalized rehabilitation program that is consistent with your doctor’s orders will be developed. 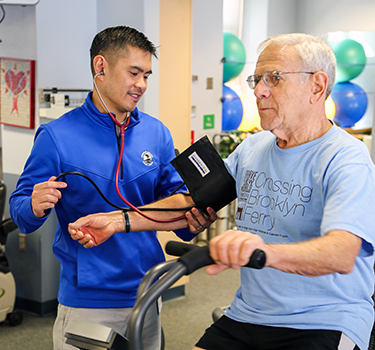 Our cardiac nurses and exercise physiologists will lead you through a monitored, progressive exercise program, based on your current fitness level and goals. You will exercise up to three days a week for up to an hour each day, and your program may include cardiovascular and strength training exercises. Our nurses and physiologists will closely monitor your heart rhythm, blood pressure, and blood sugar as needed. Our cardiac rehabilitation facility is equipped with cardiovascular equipment, including treadmills, elliptical trainers, stationary bikes, nu-steps, rowers, light weights, and resistance training machines. Showers are available for your convenience. Monday, Wednesday: 7 a.m.-5 p.m.
Friday: 7 a.m.- 12 p.m. and 1 p.m.-5 p.m.
Monday, Wednesday: 6:30 a.m.-6 p.m.
Tuesday, Thursday: 7 a.m.-6 p.m.
Outpatient occupational therapy is available Monday-Friday by appointment. Speech therapy is offered to those who have communication and swallowing problems, which may have occurred as a result of stroke, head injury, developmental delay, or degenerative conditions, like Parkinson’s disease and multiple sclerosis. We help adults with speech difficulties and assist in comprehending speech, reading, and writing. If you have trouble swallowing, you may be at risk of aspiration where you breathe food into your lungs and could develop pneumonia. At Englewood Hospital we use an advanced video X-ray technique to evaluate swallowing difficulties. The video endoscopy swallowing test takes place in the Radiology Department with a speech therapist and radiologist. Outpatient speech therapy is available Monday-Friday by appointment. We also give instructions on how to do chest physical therapy. 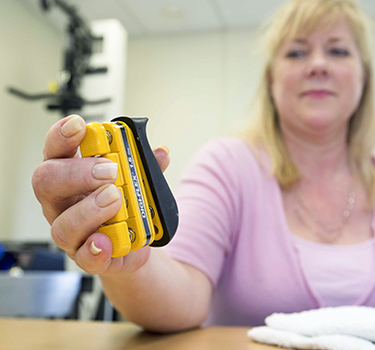 A maintenance program is available for all patients for long-term support. We can assist you in scheduling any tests you may need. For more information on the Pulmonary Rehabilitation Program at Englewood Hospital and Medical Center, please call 201-894-3805. Our outpatient Pediatric Rehabilitation program provides individualized care in a child-friendly environment. Based on a therapy-specific prescription by your pediatrician, we offer physical, occupational, and speech therapy to address your child’s gross or fine motor skills, developmental delay, neuromuscular conditions, speech, or other difficulties. Our interdisciplinary team will evaluate your child, provide personalized therapy, and involve the family in the therapy program. Englewood Hospital and Medical Center participates in most major insurance and managed care plans. Patients should verify coverage with their individual caregivers. Please contact us with any specific questions you may have at 201-894-3031. Download our Cardiac Rehabilitation brochure.